Here the higher self is awakening while the body either sleeps, meditates or readies for death. 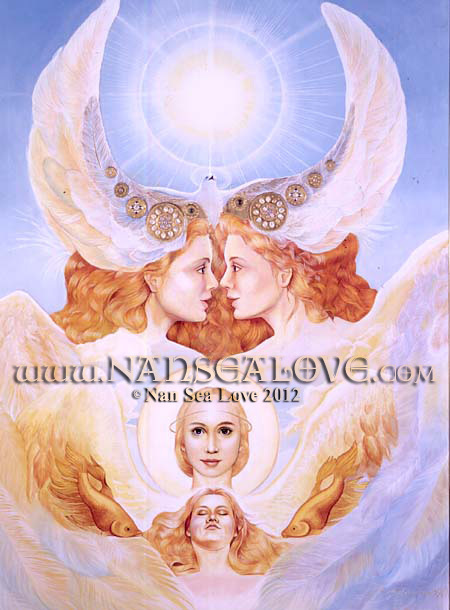 The twin faces are looking into each other's eyes with the eyes of new lovers and thus seeing with eyes of COMPASSION and UNDERSTANDING. Only with the eyes of love are we are freed from the illusion of separation from each other and the Creator of all. Until we accept that nasty little shadow we condemn in others as a repressed, but potential, part of ourselves we cannot experience the joy of oneness. Greeting cards 5 x 7 inches blank inside. © Art Copyright Nan Sea Love 2005. All rights reserved. 10% all profits gratefully donated to animals and/or environmental causes.